Ecovacs Deebot DM82 Vacuum robot information and Buy now! Deebot DM82 - Vaccum rob . . .
With Pre-payment: 1-2 work days after payment is received. Value of goods over £100 Free Postage! Ein Service von haushalts-robotic.de, in Kooperation mit Narando. The Deebot DM82 is an attractive, powerful, floor cleaning robot with advanced suction. It has a long lasting lithium battery that works upto 150 minutes per charge that vacuums with a powerful suction motor that includes an additional MAX mode for deep cleaning . Alot of robot for your money! The Deebot DM82 excels with its elegant Design and look. After its development, the DM82 had won over the hearts of the robot specialists through its beauty. The effort put into the DM82 is evident in its design, look and reliabability. This is a leader! Say yes to suction and no to loudness. The DM82 operates around the home or workplace with a very low noise level of around 56(db). This makes the DM82 ideal for cleaning around quiet environments without interrupting your activities. This robot will give a thorough clean along the edges and corners of the room through the use of its perfectly positioned side brushes. Select the MAX mode, and this robot will inform the powerful suction motor to increase its suction ability to give a deep clean. By using the timer function from its list of various functions, the robot will automatically carry out its cleaning duties without human intervention. This is ideal for cleaning while your away or while putting your feet up to relax at the end of a long day. When it's finished cleaning or its battery is running low, it will return to the charging station by itself to recharge the battery. Stair safety Technology and Advanced Anti-Drop sensors. 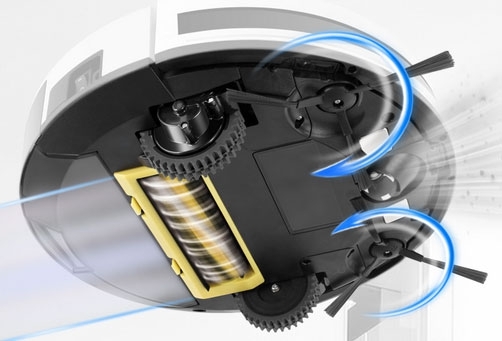 Thanks to the advanced anti-drop sensors, the DM82 cleans upto edge and around the stairs without falling. This DM82 uses infrared sensors to scan the environment ahead to avoid and detect steep drops. Thanks to the new remote control, you can select all the settings of the DM82 by reading the remote display. This means that you can operate your robot without having to bend down to select the options on the rebot, but instead, operate it from the comfort of your chair. What can I do with the remote control? The Deebot DM82 moves safely around your home with smart Anti-collision sensors to detect objects and navigate around them for uninterrupted cleaning. You can test the DM82 for upto 14 days in your Home. If you discover that this robot is not suitable for you, send it back zurück. The only charge for the 14 day test period is the return postage if you decide to send it back to us. We offer a 2 year guarantee on all of our robots and free customer support 5 days per week. Unfortunatly there is no reviews for this product. Can I really test the robot for 14 days? Why is the Deebot M82 so cheap? Ecovacs would like to establish itself across the european market. This is why Ecovacs is selling very high quality products for such a fair price . The quality of the DM82 is very high and is considered to be one of the very best on the market. How does the DM82 clean the corners and the edges? How do I empty the dust container of a Deebot M82? Does the DM82 operate itself during the vacuuming? Yes, once you have set the timer function, the DM82 will activate at the exact time that you had pre-set it to operate and then it will automatically clean your apartment without any more input from you. If the battery starts to run low, then DM82 will automatically return by itself to the charging station and charge itself. Once charged, it will resume with its cleaning cycle from the same spot to which it stopped before it returned to the charging station. Can the Deebot DM82 clean under the furniture? Does the Deebot DM82 have a high quality battery fitted? Yes, it is a Lithium Ion battery with 2.500 mAh fitted. These are modern, high quality and powerful batteries that are able to run for longer periods of time. How do I change the side brushes on a Deebot M82? 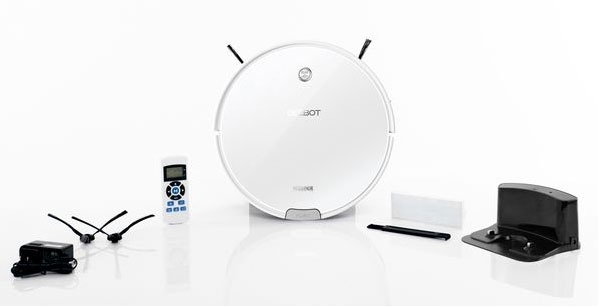 How long is the Guarantee on the Deebot DM82? The manufacturer gives a guarantee of 2 years on the Deebot. The Battery has a 6 month guarantee. Within this time frame, your warranty will provide you with a replacement or repair. 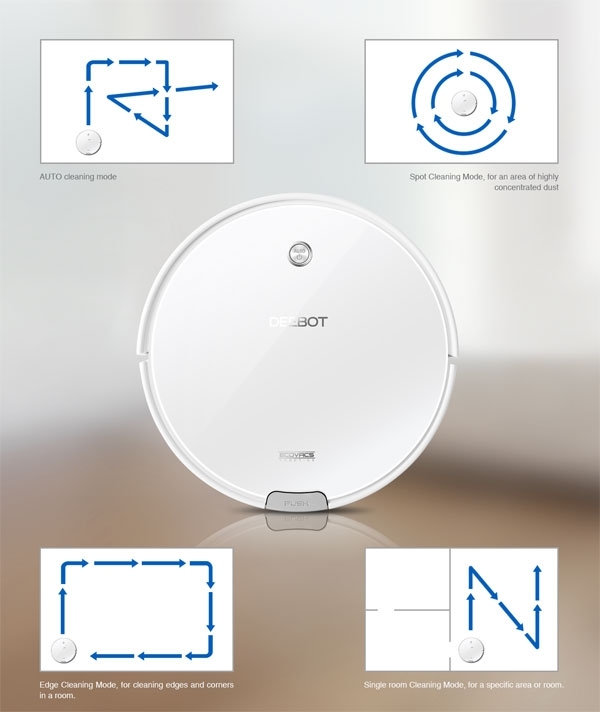 Which floor types can the Deebot DM82 clean? The style can clean all floor types apart from carpet that is more than 3cm in height. It is possible that your robot may experience problems if your floor surface is a mirror finished dark black covering. Can the Deebot D8 pass over raised door sills? Can the Deebot fall down the stairs? How do I change the main brush in a Deebot M82? Is the Deebot suitable for allergies? Yes, the deebot has a special HEPA-Filter. This ensures that the released air that has passed through the filter is cleaner. Does the Deebot DM82 have a Remote control? Yes, the Deebot has a modern remote control with LCD Display. The remote allows you to change many settings on the robot and to also operate it from a distance. How do I change the Filter by a DM82? Is the Deebot DM82 quieter than the other models? Yes, it is one of the quietest on the market. It is approx. 20 dB quieter than a Neato Botvac and the iRobot Roomba. How do I set the timer function on a Deebot M82? Does the Deebot DM82 have any sensible sensors which are different? Yes, it has a new generation of sensors fitted. These are very fine and sensitive sensors that detect obstacles. Can the Deebot M82 pass over carpet and door sills? Yes, the Deebot M82 passes over carpet and door sills upto 2 cm in height.